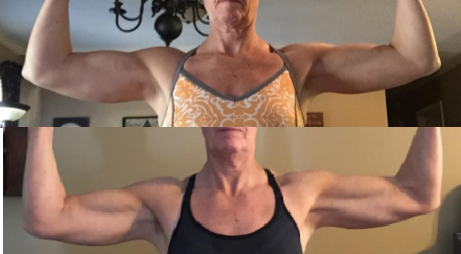 Lynn is an online training and nutrition client who had been lifting weights for quite a while when we connected in a forum on bodybuilding.com. Despite her athletic background, she had several goals that she wanted to accomplish but wasn’t sure of the best way to achieve them. She had worked with trainers in the past and was using some of their programming on her own. Lynn had several old injuries that flare up from time to time, and she was worried about being able to work around them if that happened. We had several conversations about this and her background before we started to make sure that I understood what was going on. 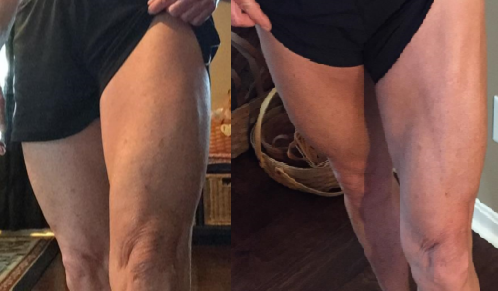 After reviewing her history, I made some changes to her approach – a different workout split and more programming for her goals, maintenance calories, and additional recovery time. I’ll add that our goal was not weight loss on the scale and we’ve worked to adjust calories to keep the scale from moving. As we worked together, there were a couple things that came up with her injuries and I was able to make immediate changes to accommodate her limitations and keep her pain-free. I make sure to answer questions in a timely manner and also to explain the reasoning behind my approach. Here’s some great feedback from Lynn partially through her program. “When I had a question Tuesday while working out, I had no hesitation in sending you an email asking my question, knowing that a response would be provided soon. Not only did you respond quickly but it was before I actually finished the set that had the lift in question! Many people mistakenly believe that you won’t see much in the way of progress if you aren’t a beginner. Lynn shows that isn’t true. With effective programming, challenging workouts, and adequate recovery time and calories, you can make changes regardless of your experience level. Read what she has to say about working with me and the results she is seeing with her training and nutrition experience. There isn’t one thing that I would like different from you or the program. My main reservation was understanding how someone who would not see me would be able to adequately assess my needs, progress, and results. I also did not know how you would be able to understand physical problems that might arise. Looking back now, with the nagging issues I’ve had and we have worked through, I have to laugh. Attention to detail! On more than one occasion I mentioned something, either in my check in notes or in another email, and that information was later taken into consideration in the development of my next workout. Without question, there is thought and time given to my questions and comments. Also, my nagging physical problems have not been an issue for you either. Your knowledge allows you to take what arises and provide a solution. I wanted to reduce the love handles that I have seemed to have forever, despite achieving a weight that was way too low for me. Increase the amount of muscle in my upper body. I am lifting weight that I never thought possible! Before I began working with you, “If you always do what you’ve always done, you will always get what you’ve always got” describes the road that I was on. As you know in my efforts to lose fat, particularly love handles, I was eating insufficient calories. I eliminated certain foods, and had unchanging workouts. I eventually lost weight but muscle was sacrificed and the love handles remained. I had been working out for about 15 years, spending a lot of time in gyms, seeing many trainers work with their clients. A few years ago I used a face-to-face trainer so the decision to use an online trainer did not come without some reservation. How could someone online train me? How would they be able to know what I need, see how I am progressing? I asked these questions and concerns in our initial email conversations and your patience and knowledge became evident, removing many of my doubts. Since I began working with you my weight on the scale has shown little change but my clothes are fitting looser and differently. My body is changing. I no longer feel the need to endure exhausting sessions of traditional cardio several times a week to achieve the body I desire. I have learned that it is not the amount of time spent doing cardio that determines the look of my body. It is the decisions I make many times a day, the decision of what I eat and working a quality lifting program. Today I am eating more calories than I have in a long time and my cardio involves activities that I enjoy, things that I look forward to doing, things that involve movement. I could not be happier with you and the program. I am looking forward to what we will accomplish as I begin a new group of sessions with you. Thank you for all you do, Adrianne!